Most people remember what they were doing when key historical events take place. I was six years old when John Lennon was shot dead outside his apartment in New York City on December 8, 1980. I can recall that day as clearly as if it happened yesterday. My elder sister and I had been picked up from school on December 8, which was unusual as we normally walked the short distance back to our house in Garstang. My sister and I loved The Beatles. Our parents were both The Beatles fans so we grew up in a house which played The Beatles a lot. We were even allowed to borrow my dad’s vinyl’s, which was a big deal back then. Big sister and I used to argue over which one of us would marry John Lennon. Typical middle child that I am, I was always willing to compromise and take Paul McCartney if I must. But we both idolised John Lennon. That day, after school my mum took us to a shop in Garstang called Carrs which was a confectioners situated on the high street. Mum bought both of us an ice cream and as we sat in the back of her car she told us that John Lennon was dead. My sister started crying. I was shocked, carried on eating the cone and couldn’t really understand what I was being told. I remember asking my mum whether this meant that The Beatles would never make any new songs? Fast forward thirty-three years and I find myself standing by the John Lennon memorial inside Central Park, New York City. 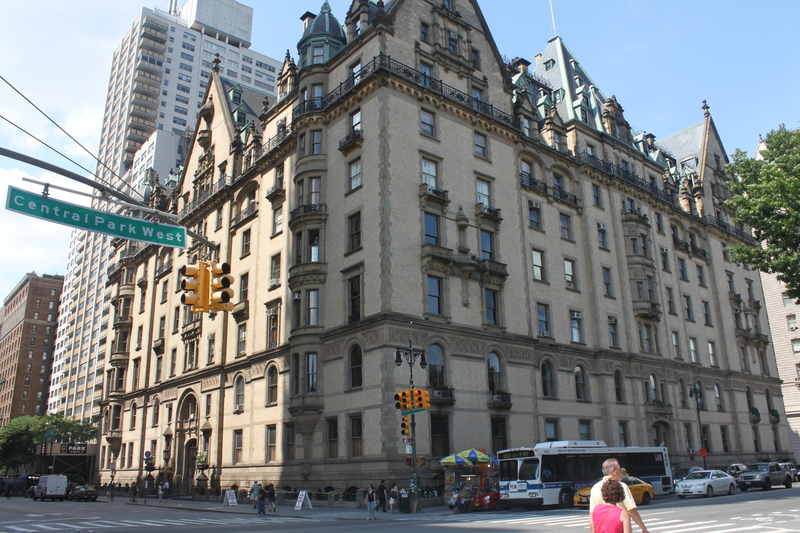 The memorial is at the edge of the park next to the entrance which Lennon’s apartment, the Dakota Building overlooks. 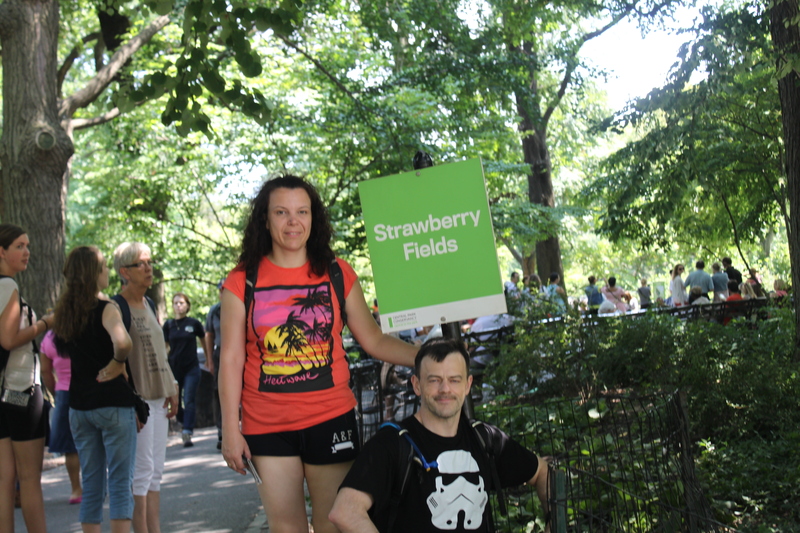 To get to the memorial the public have to walk through a green area called Strawberry Fields and then the memorial is ahead. On the day that I visited this there was a man singing lots of old Beatles songs which just added to the atmosphere of the park. I told the tale to my son of how I found out about John Lennon dying and then we walked over to the Dakota Building. It was a surreal moment, who’d have thought that six-year old Sarah sitting in her mum’s Vauxhall Viva eating mint choc-chip ice-cream would end up standing outside the legend’s home in the Big Apple. 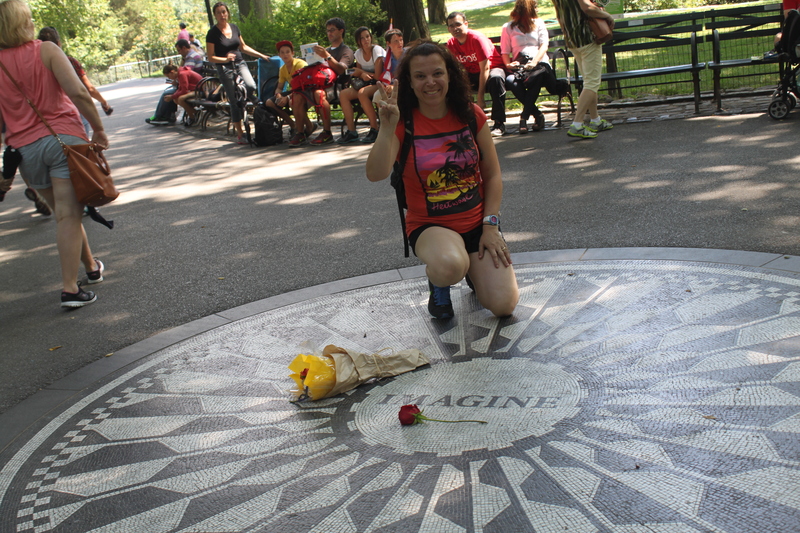 This entry was posted in Blog, USA and tagged blogging, Imagine, John Lennon, New York, New York City, NYC, The Beatles. what an interesting theme for this blog challenge! I have not been to New York, so it will be great to continue to see it through your eyes for now. It shall suffice, until I can finally make it there. Have a great day!